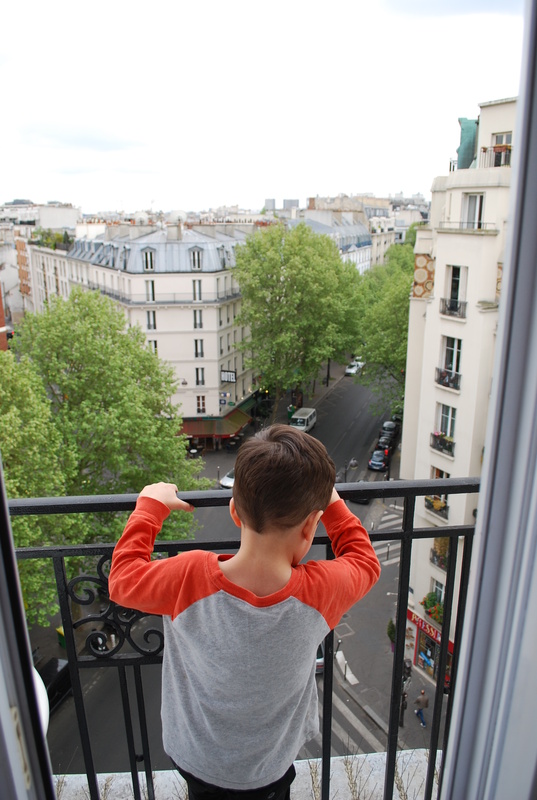 We planned a getaway to Paris over Joe and Sam’s school spring break for a couple of reasons. Joe had never been there before, and we didn’t want to spend our year in Europe without going to at least one of the big cities that tourists usually visit. I’ve always liked Paris, and have some French language skills that make traveling there easier than going to Italy or Spain. And most importantly, we were able to coordinate the dates with my mom to meet up with her there for a couple of days while she toured through Italy and France with a friend (hi, Linda!). Ulm is a bit of a train hub, so it was no problem to find a train route without connections to get us to Paris. We did have trouble booking the seat reservations for the kids, because they’re minors in Germany but not in France, so we went to the info desk for some human help. The attendant was able to snag us four first-class seats for a cheaper fare than second-class! We were happy to have a little bit of extra room and some charging ports for our electronics. We stayed the night before in a hotel near the train station since our train departed pretty early the next morning, and Lucy proceeded to bonk her forehead on a bedside table. You may very well see a goose-egg lump on her forehead in some of these photos, and that’s the reason why! 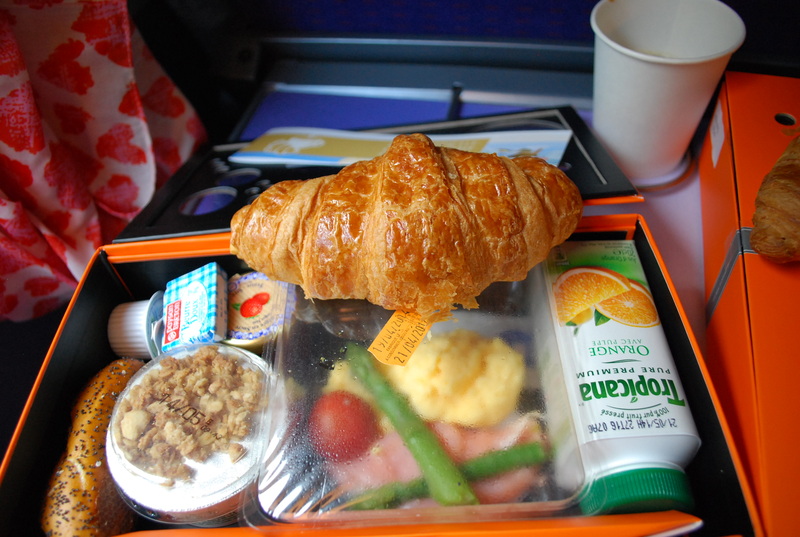 In the morning, we ate some so-so train food and tried to keep the kids occupied for the 5-hour journey. They fared well until we crossed the German/French border. After Strasbourg, the TGV train began its high-speed route through the rapeseed fields of central France. It’s hard to see, but the right-hand photo above shows the display screen with a speed of 311 km/hr! To achieve such high speeds, the train cabin was pressurized and became very hot and stuffy. That’s when all four of us began to feel some degree of motion sickness. Both Sam and Lucy fell victim to the nausea, so we arrived at the Gare de l’Est quite a bit worse for the wear. For most of our week in Paris, we avoided the metro because it’s too hard to navigate with a stroller. 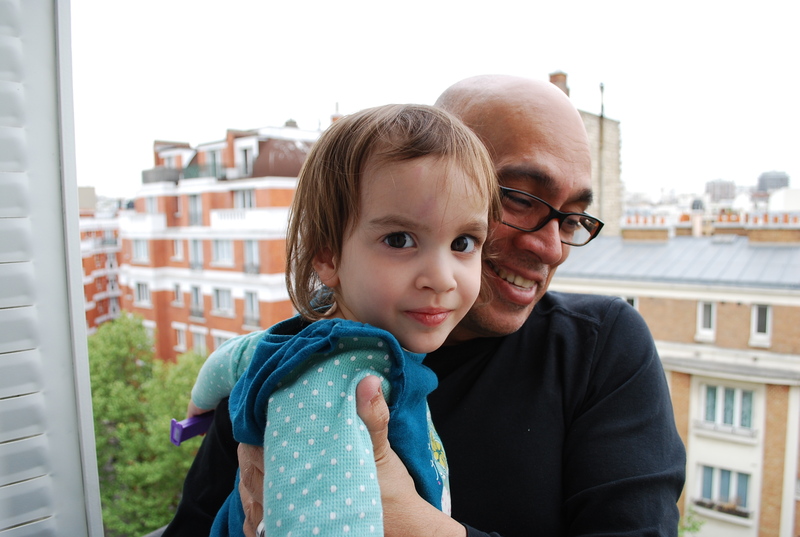 We took a city bus to our rented apartment in the Ledru-Rollin neighborhood in the 11th arrondissement. After checking in with the landlady, we were finally able to relax and recover a little. 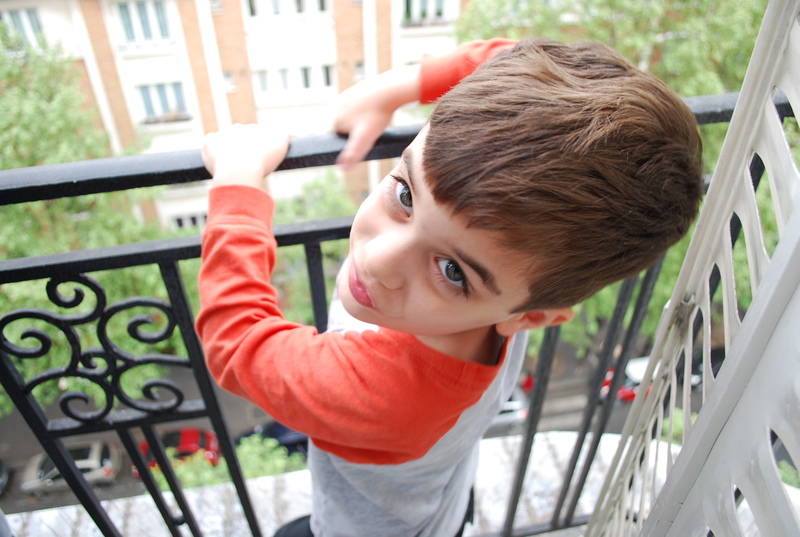 We enjoyed the view from our apartment, and it was nice to have a small kitchen and an extra bed for the kids. It was on the 7th floor (!) of the building, but luckily had a tiny elevator that would carry one adult and one child or suitcase at a time. The elevator was an experience in and of itself! Shame I didn’t take any pictures of that odd bit of machinery. We decided we were too exhausted from the train journey to attempt the restaurant meal and Seine river tour on the Bateaux-Mouches we had planned. Instead, we bought some groceries from a nearby shop and made dinner in our apartment so we could get to bed early. Such is the life of families with young kids! 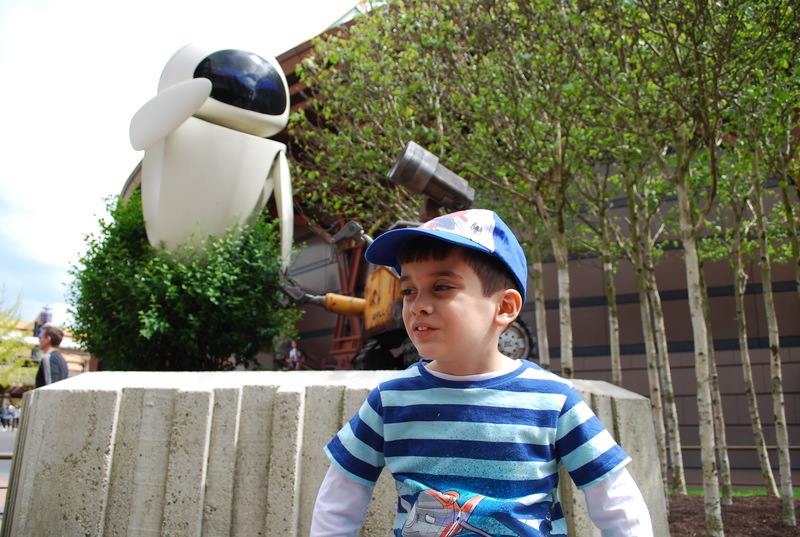 We felt like silly tourists, but Sam’s been asking to go to Disneyland since he first saw a TV commercial featuring Buzz Lightyear as a two-year-old. 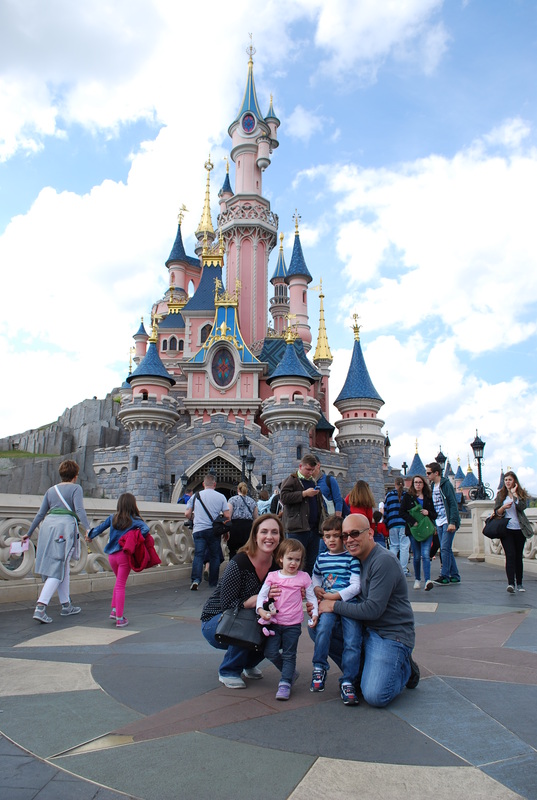 We decided that his enthusiasm combined with Lucy’s obsession with Minnie Mouse meant that we couldn’t pass up the convenience of a day-trip to Paris Disneyland. 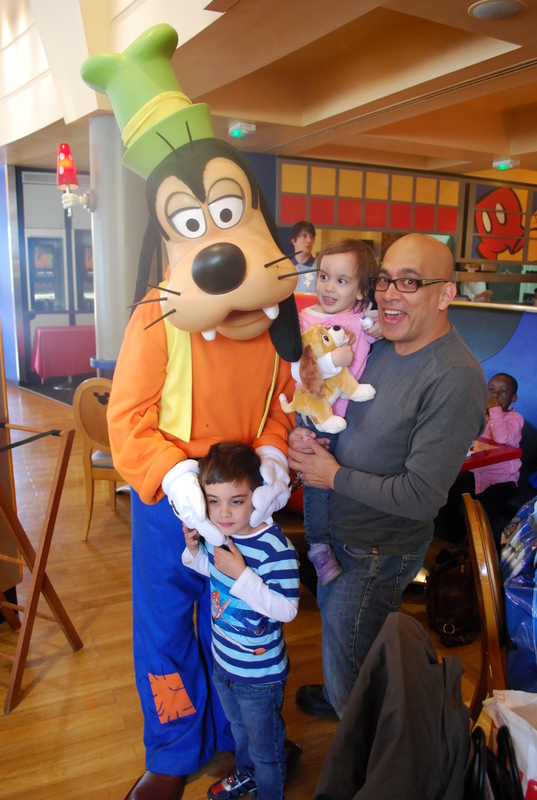 We took the metro and the RER train a half-hour outside of central Paris to arrive at the crowded Disney gates. 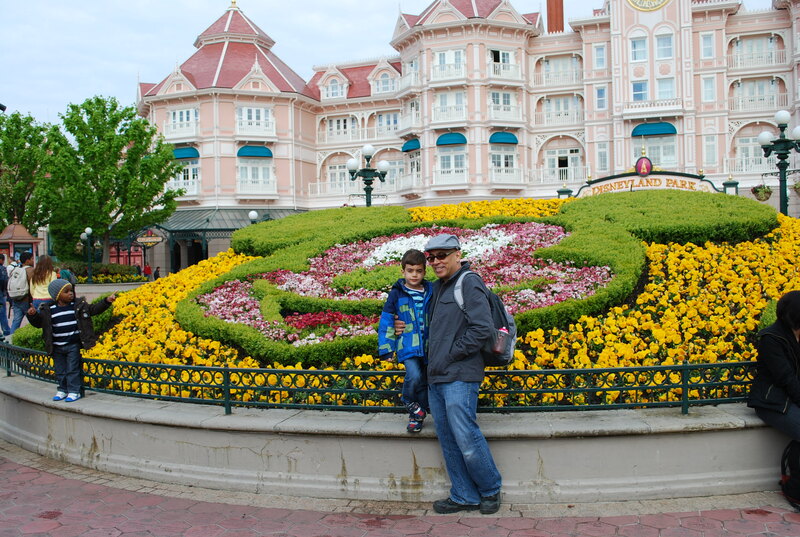 Here’s Joe and Sam posing for the requisite photo in front of the Mickey topiary out front. 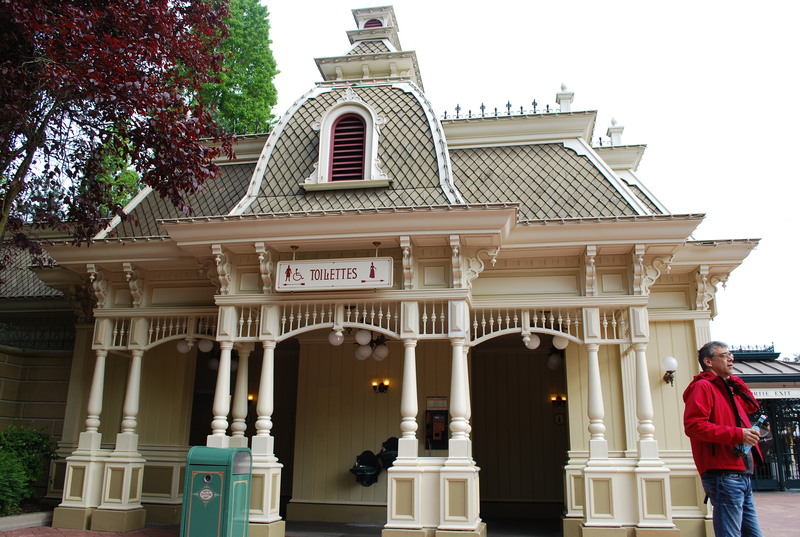 Even “Les Toilettes” were cutely designed, in typical Disney fashion. Lucy and I spent a large part of the day waiting for Sam outside of these fixtures. 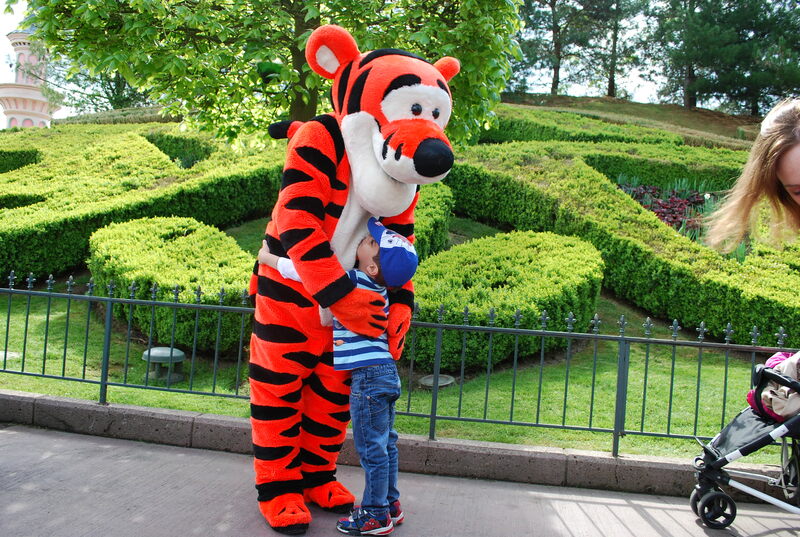 It’s been a long time since I visited a theme park with a preschooler, and it’s not always easy! 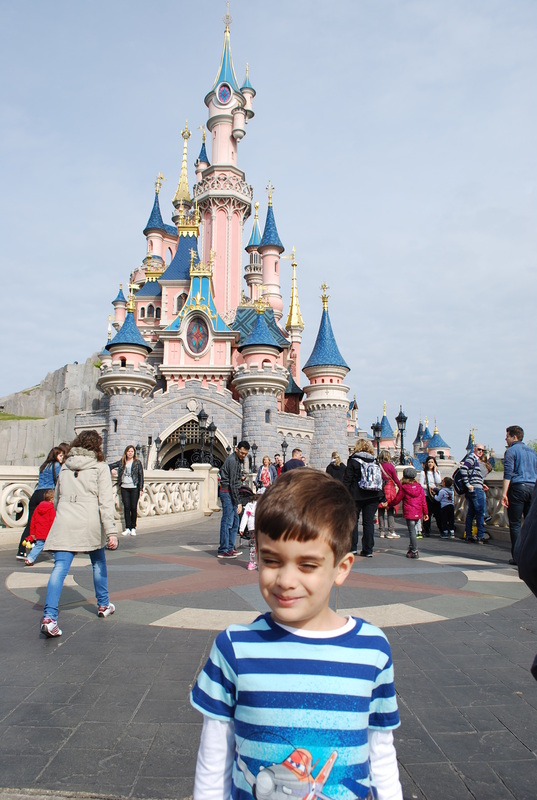 And we had to get a castle shot of Sam, as well. The Paris Disneyland castle is especially pretty. Travel websites mention that they had to make it especially fantastical to compete with all of the real castles in the nearby region. 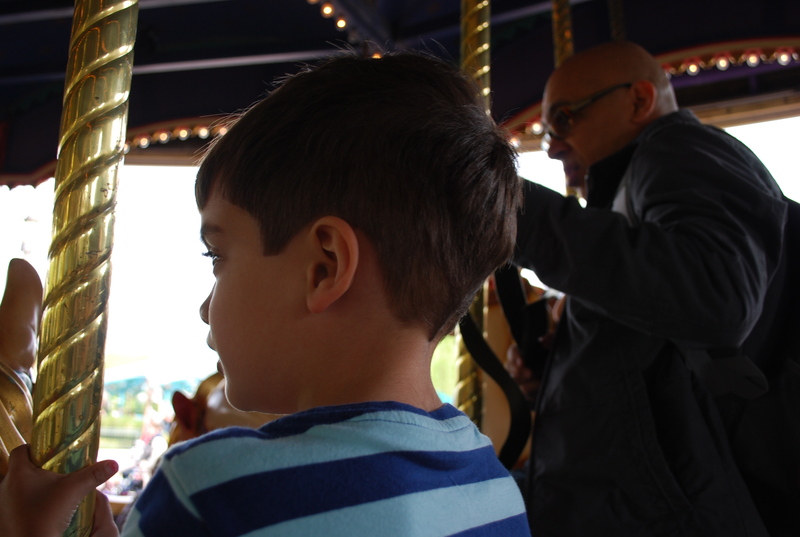 We waited in our first queue, for the carousel. 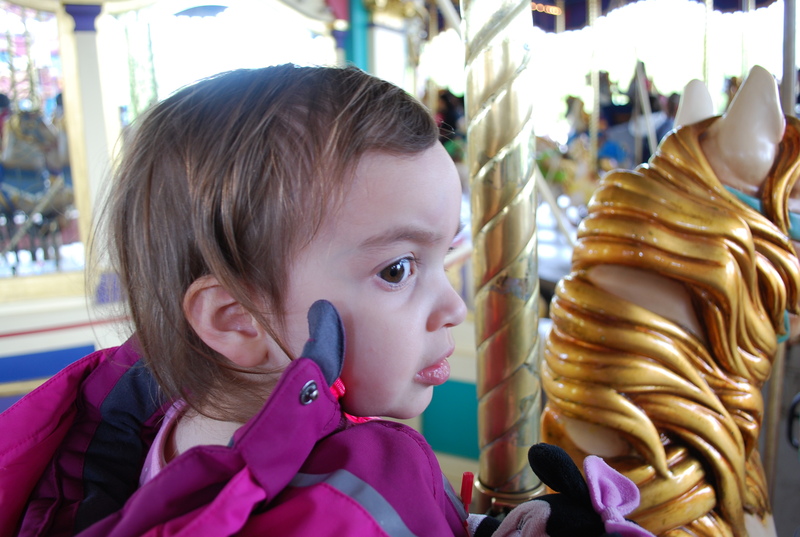 I had planned to pass this one up, since there are so many carousels for tourists to ride all over Paris, but Sam insisted. And he was right, it was worth the wait. I spent the ride standing next to Lucy’s horse and making sure she didn’t fall off. 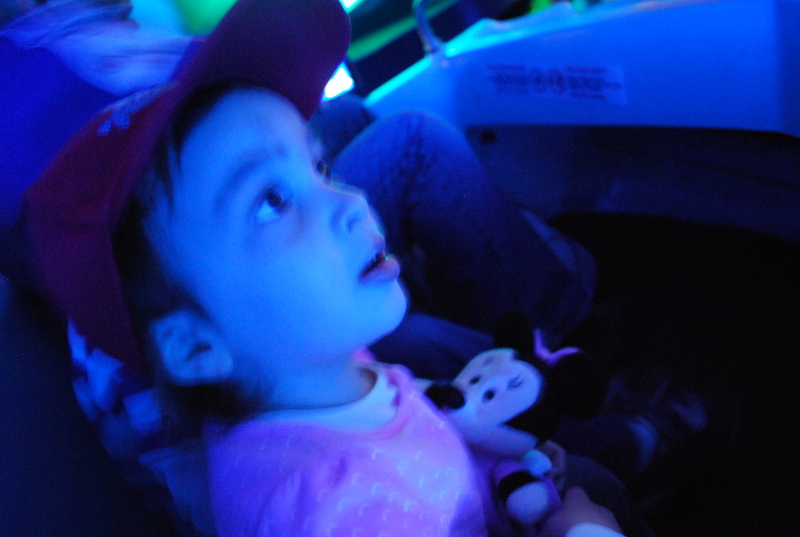 Next we went to the It’s a Small World ride. 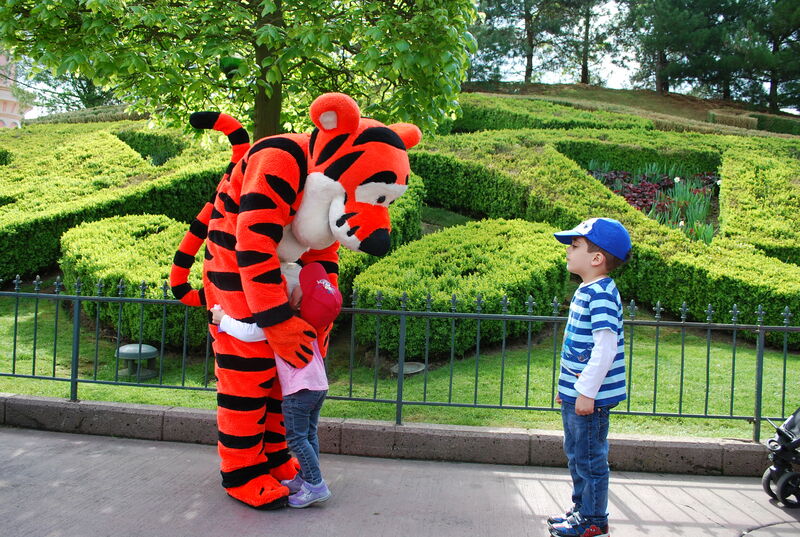 Not my favorite, but every travel website said that it was the best option in the park for small kids, and possibly the best of the Small World versions amongst the various Disney parks worldwide. 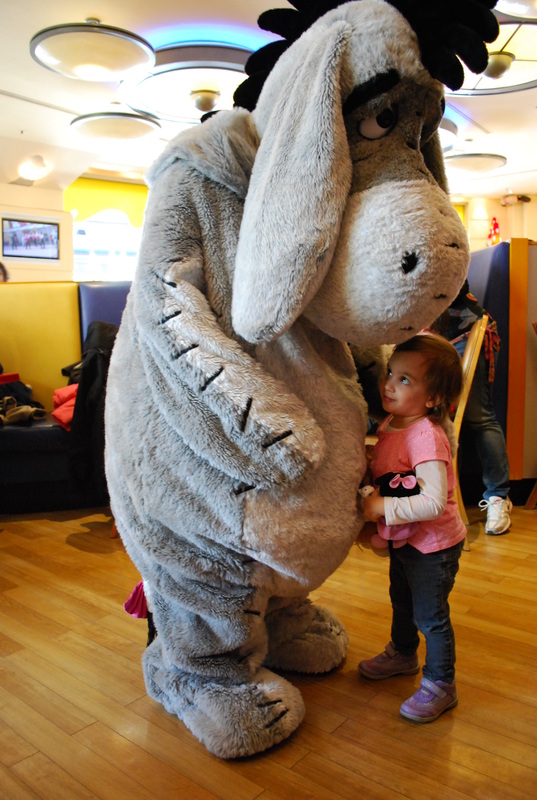 Their advice was spot on, and my kids adored the experience and watched the animatronic dolls singing with awe in their eyes. 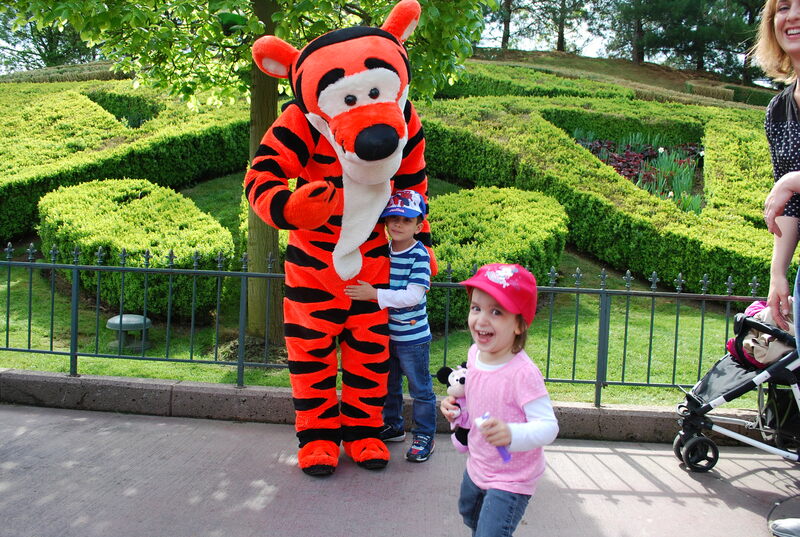 Then we met Tigger. I think we could have left at that point and called the day a success. In Lucy’s opinion, it was already the best day ever. We managed to tour the inside of Sleeping Beauty’s castle as well as the animatronic dragon in the cave underneath. Sam still swears to this day that the dragon was real, and we can’t convince him otherwise. It was a bit too dark in there to take any photographs, however. 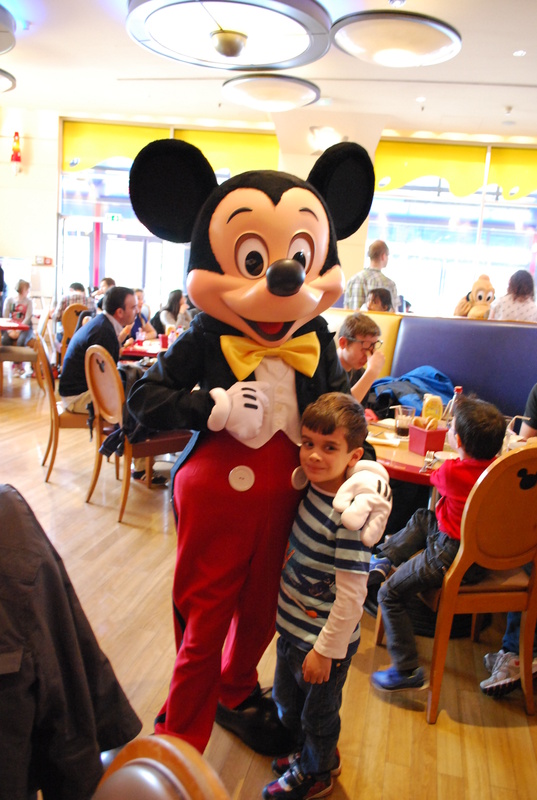 Then we hurried out of the Disneyland park for a character lunch at Cafe Mickey. 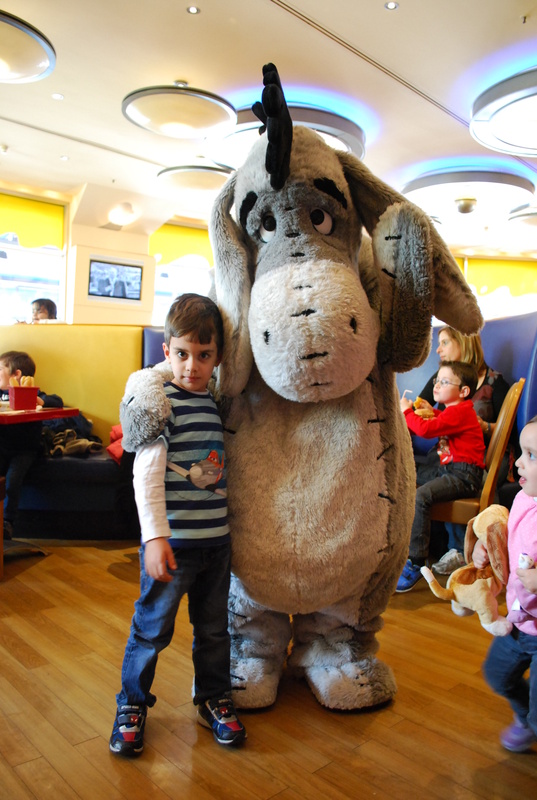 We had booked this spot in advance, because we knew that we wanted our kids to have a chance to meet a few characters in costume without having to wait in long lines. 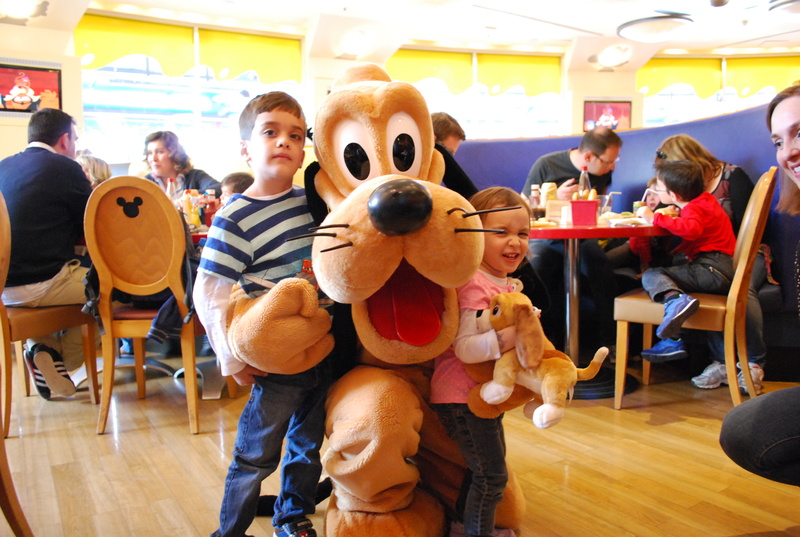 Neither of my kids ate much of their food due to the excitement, but it was well worth it. 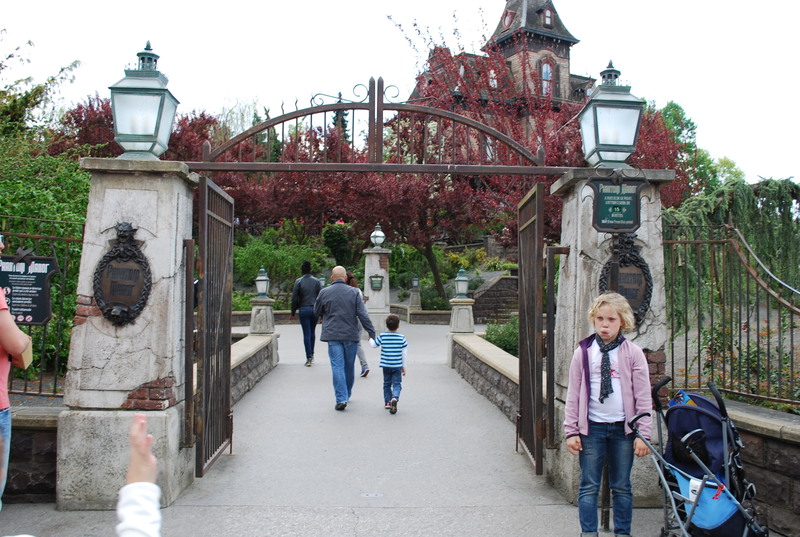 We went back to the park and visited some of the other lands. 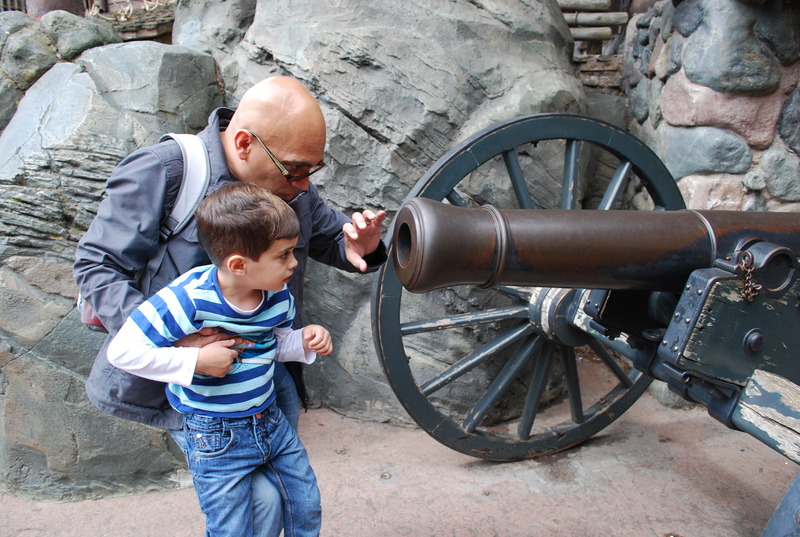 In Frontierland, Joe and Sam inspected the cannons and attempted a tour through the Phantom Manor. Unfortunately, the ride broke down while they were in line and they didn’t get a chance to experience the haunted house. 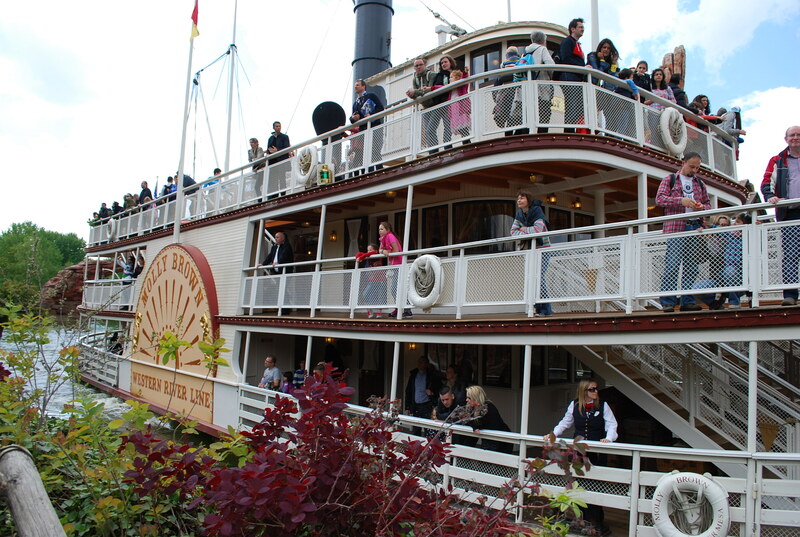 Meanwhile, Lucy napped in the stroller and I greeted the riverboat’s arrival and watched the Big Thunder Mountain ride get stuck and evacuated. 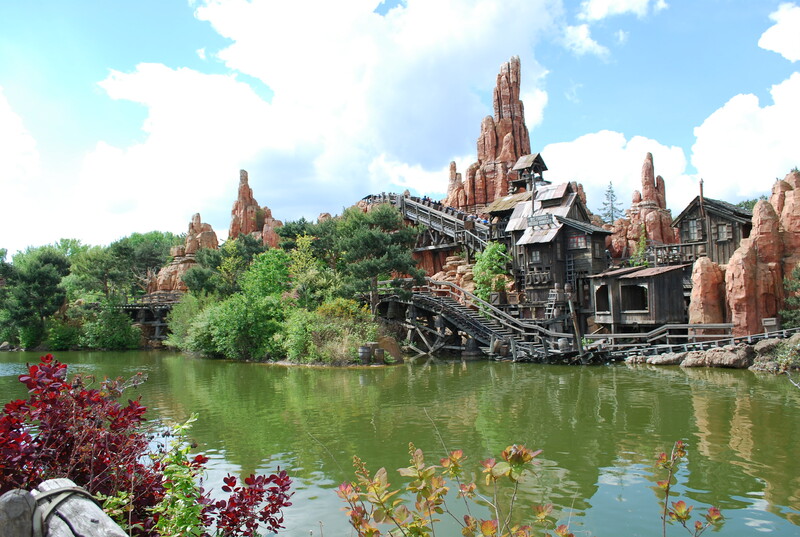 It wasn’t a good day for ride maintenance at the park, apparently. 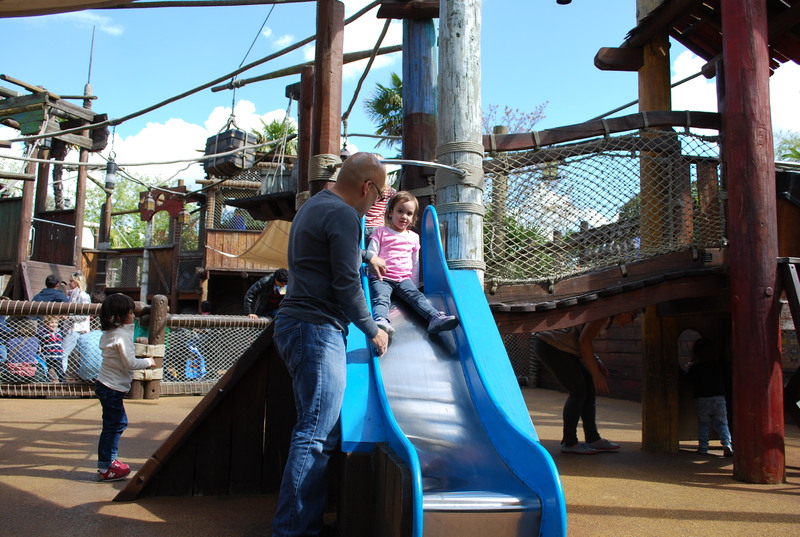 Then we went to Adventureland and explored the many bridges and tunnels on the Adventure Isle and let our kids burn off some extra energy at a nice playground they have there. 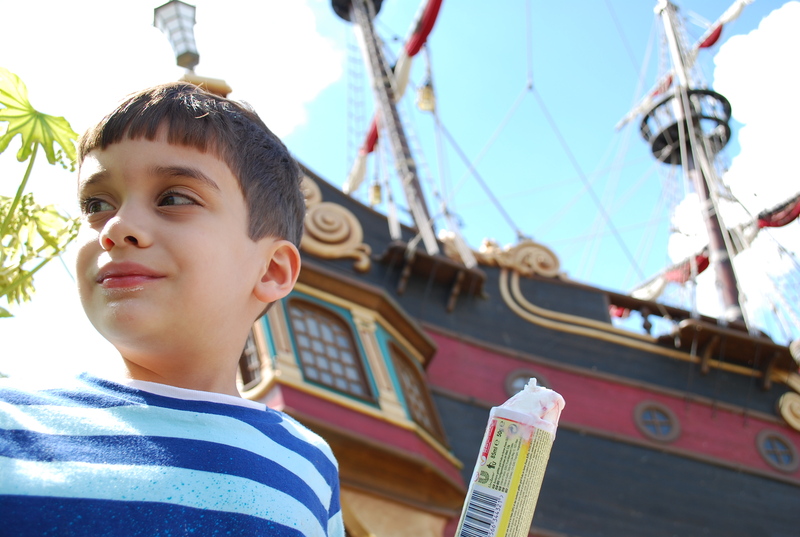 It was fun to see a life-sized version of Captain Hook’s pirate ship. Lucy woke up from her nap in time to play on the playground, so afterwards we bought the kids some popsicles to help beat the heat and keep their spirits up. 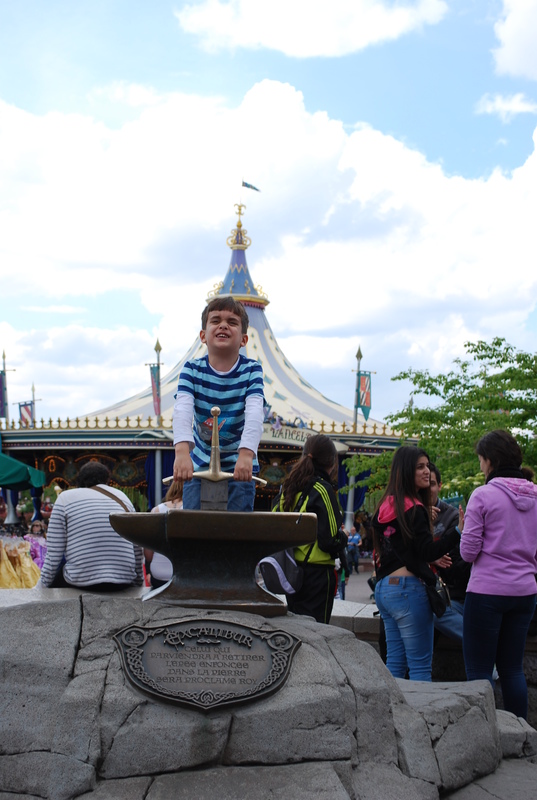 Sam tried to pull Excalibur out of the stone on our return journey through Fantasyland. We had to break the news to him that only the true king of England can succeed, and he was mightily disappointed! 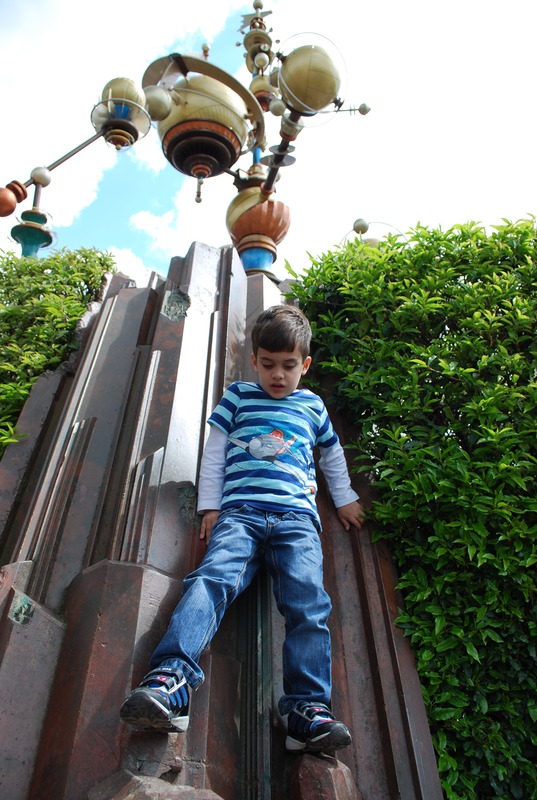 In Discoveryland, Sam found some sculptures to climb and even spotted Wall*E and Eve! 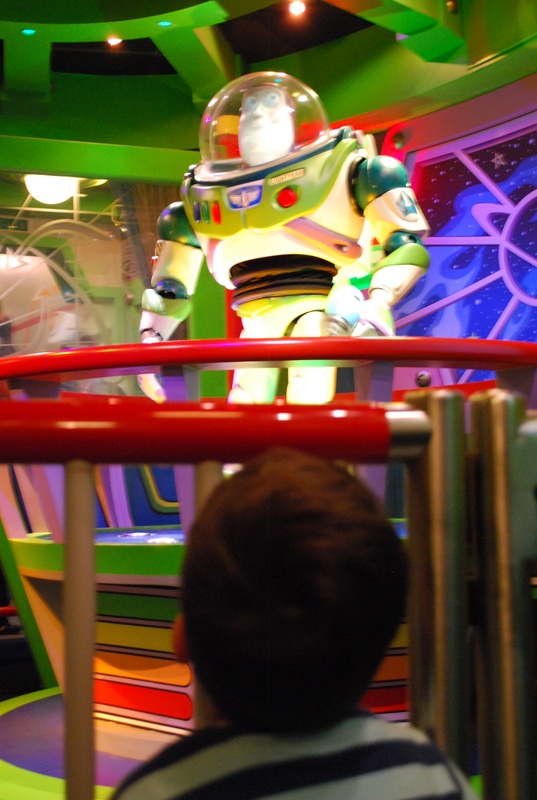 We used a Fast Pass we’d picked up after lunch to avoid the 2+ hour wait for the Buzz Lightyear Lazer Blast ride. I wasn’t sure if it would be too much for my kids to handle, but they both enjoyed it. The inside of the ride has a lot of black-lights and targets you’re supposed to shoot at with your laser gun, so it didn’t make for very good picture taking. 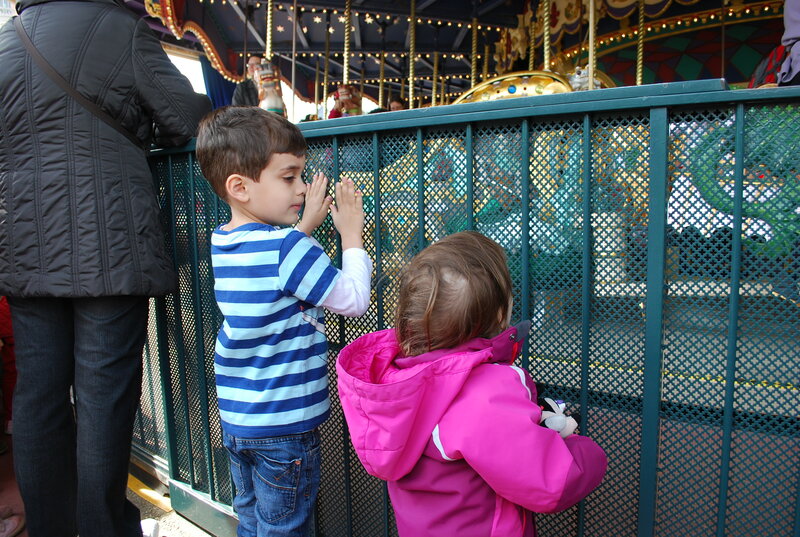 We had planned to go back to Fantasyland for a bit before catching the parade, but our kids had other plans. They needed a snack so we spent a good half-hour waiting in line at a snack bar for some food. Then, the clouds coalesced and drenched us with a heavy downpour. We abandoned our plans because of the weather and our exhaustion, and instead went to wait in line for the train. Paris Disneyland has a steam-engine railroad that runs the perimeter of the park, so we rode that back to the Main Street portion of the park where we had dinner reservations waiting for us. 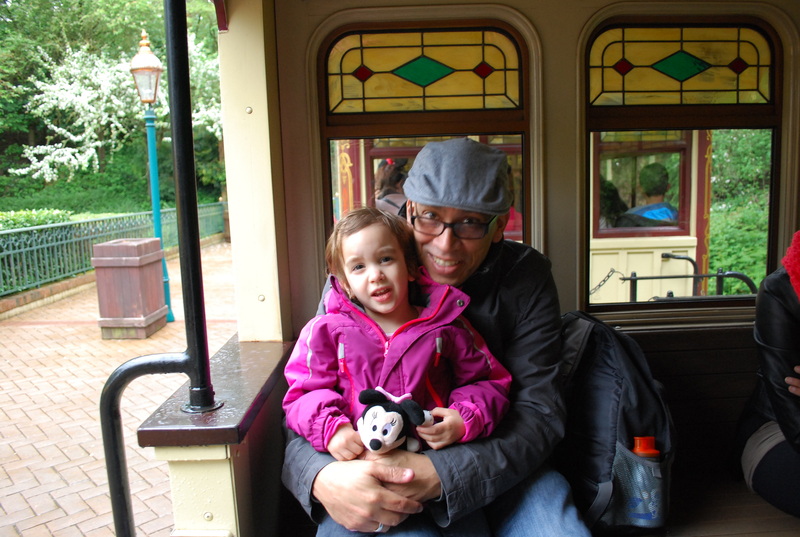 Lucy really liked riding on the train, despite the fact that we’d ridden trains to get to Paris and to get from the city out to Disneyland. Perhaps this train better matched her schema for what a train should be, with real “choo choo” noises, unlike the modern counterparts we’d previously encountered. 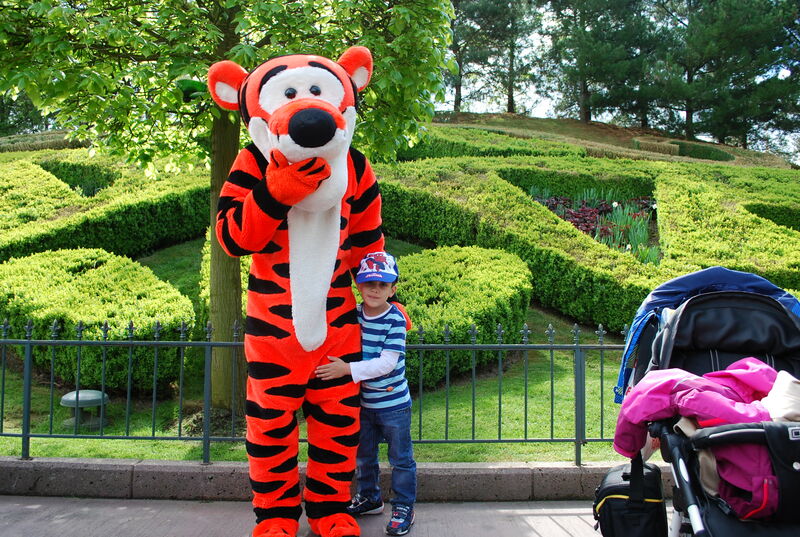 Our excursion to Paris Disneyland was well worth it. 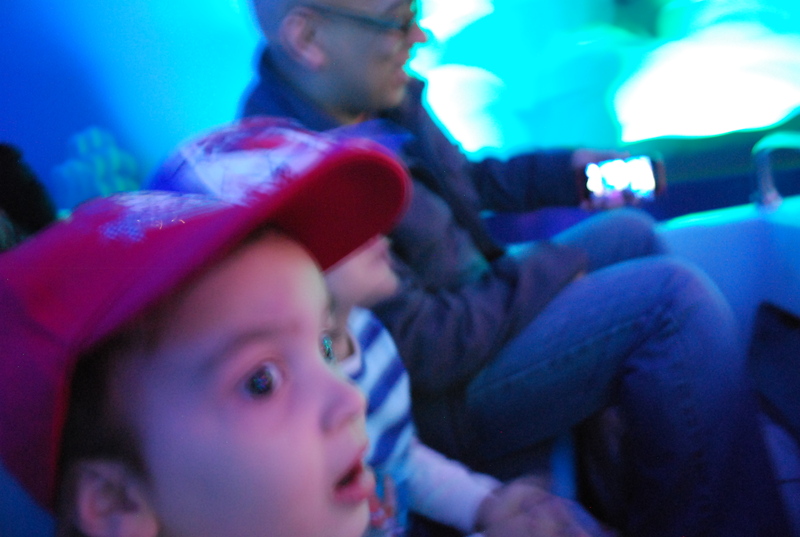 I was surprised by how well our kids handled all of the stimulation and excitement. I’m glad we managed to pack so much into our single day there and have such a magical time. This entry was tagged Castle, Exploring, Train, Travel. Bookmark the permalink. How fun, I am glad you posted this Betsy. What a full and fun day you had.